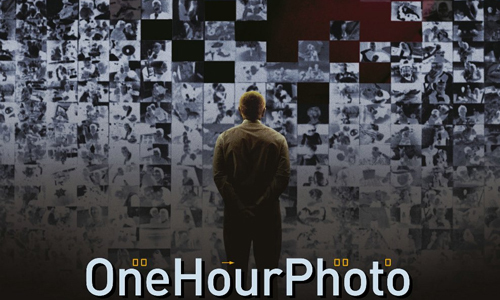 Mark Romanek's under-appreciated One Hour Photo came about during a transition period in the mainstream photography scene, a point addressed early on in the film. Before the age of digital cameras -- where people take thousands of shots nobody ever sees, duplicate them at home, and wipe them away with a few clicks -- snapshots either needed to be processed in a dark room or entrusted with a lab for developing. That meant a person doing the developing would see , and possible remember, every single candid shot and glimpse at one's private affairs. Romanek saw that suspicion as an opportunity, framed in a sterile department store and centered on the seeming trustworthy clerk whom you'd give those rolls of memories. Could that person have been Sy Parrish (Robin Williams), the bespectacled, clean-cut employee who obsesses over a repeat-customer family? The strength in Romanek's thriller, a comment on blind trust and valuing the family dynamic, lies in how eerily possible that might be. Should it be reassuring or alarming that the first image of Sy is of his in-custody interrogation? That's the direction Romanek takes the audience, down the path of misgiving from the moment Sy offers his perspective on his time as a SavMart photo-lab manager, a job he takes very seriously; he calibrates and measures prints with the utmost care, diligently remembering repeat shoppers. The most important of all his customers, though, is the Yorkin family: an unpretentiously beautiful mother, Nina (Connie Nielsen, The Devil's Advocate); the busy bread-winner father, Will (Michael Vartan, Alias); and their young, caring son, Jake (Dylan Smith). Sy knows these people in ways most don't, from memorizing their address and the size of their home to the idyllic appearance of their domestic situation, adorned with birthday parties and little-league games. What's also shown, though, are the moments when he returns to his home, a sparse apartment full of the Yorkin's photographs. Romanek could've easily forced Sy into a caricature of a stalker or an unashamedly disturbed villain, but instead he takes a more complex route: he's interested in bringing this man as close to "normal" as the thriller's setting and purposes will allow, until the situation no longer allows it. Constant narration -- Sy's interrogation -- beckons the audience into the space of his mind, revealing his tolerant and often rewarding outlook on his customers. When he discusses unsavory people, they're neutral observations with a twang of judgment, not unlike the musings of regular Joes. When he discusses the family dynamic, his outlook is almost admirably idealistic, as if he only knows of the families depicted in perfect photos. Navigating the intricacy of his mind becomes a sharp, disturbing experience as the knowledge of his police custody crosses our minds, and Romanek plays with that idea as Sy uses his job to cross boundaries in ways the general public would rather not consider. He's the worst kind of monster: the one you really couldn't foresee as being one. 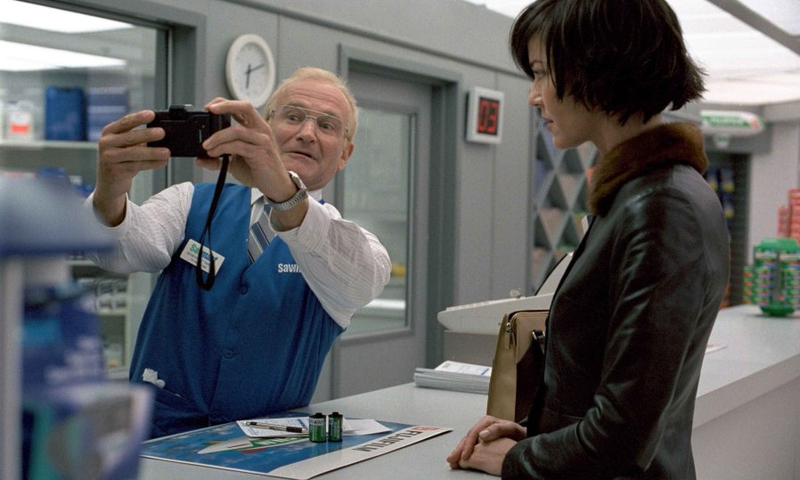 One Hour Photo's success, both in terms of intensity and dramatic potency, hinges on the utterly chilling performance from Robin Williams. While Good Will Hunting and Insomnia unveiled a comeback in his serious dramatic side, presenting him as physically intimidating and apt at carrying a dark past, Sy takes his talent in a more cunning, sinister direction than previously seen from the animated comedic actor. From behind large-framed glasses and under a peculiar blonde haircut, the intense eyes that Williams gives the photo-lab manager hide a disturbed man with a void in his life. The psychosis and obsession he conveys through nuanced facial reactions can be pretty remarkable, where the stillness in his gazes and the calmness in his voice often send chills down the spine when he interacts with families, co-workers, and children. The performances around him create a "safe" mid-sized town atmosphere -- Connie Nielsen's honest warmth lures in our attention as she drops off film and eats at a mall -- proving ideal for Sy's under-the-radar fixation. Romanek explores a mesmerizing visual tone that becomes crucial as we're making heads and tails of Sy's mind, where the cinematography of Jeff Cronenweth (Fight Club and The Social Network) switches between sterile, void sparseness and multihued vivacity for some clever jarring effects. He bathes scenes in the Yorkin's lush upper-scale home with overbearingly warm oranges and browns, emphasizing a false sense of safety and perfection, while the stark-white aisles of SavMart almost convey a sense of blinding clarity through the eyes of Sy. The film very much filters through his point-of-view as his narration guides the audience within his psychosis, where the few impartial glimpses at his life blow the notion of privacy open by a mosaic of photos on his apartment's wall. Backed by Reinhold Heil and Johnny Klimek's pulsating, haunting score, this is a striking sensory experience that lulls the audience into a bizarre combo of sensations between ill-omened fear and cautious sympathy. That's the nature of a beast like One Hour Photo, a Hitchcock-esque exploration of the underbelly of the mundane ad the family dynamic, not unlike a twisted combination of Cape Fear and American Beauty. Romanek's film is, admittedly, far more interesting during Sy's descent into mania than when he's finally pushed over the edge though, driven by circumstances that come across more as overstated developments to elevate suspense instead of a natural progression of his mental instability. Romanek undeniably goes for bizarre shock value as his punctuation, which waters down the organic human properties that he's worked so hard to develop. Yet, even when he takes Sy into the world of the truly demented, the reason he's locked in cuffs and answering questions, Robin Williams and Mark Romanek still generates a disturbingly authentic perspective on idealistic relativism, and how the mind of "The Photo Guy" who yearns for the family in those snapshots is truly calibrated. Sy isn't the guy who processed your rolls of film, but it makes you wonder who that person really was.